Indian Bhel is one of the popular Indian chaats loved my almost everyone. 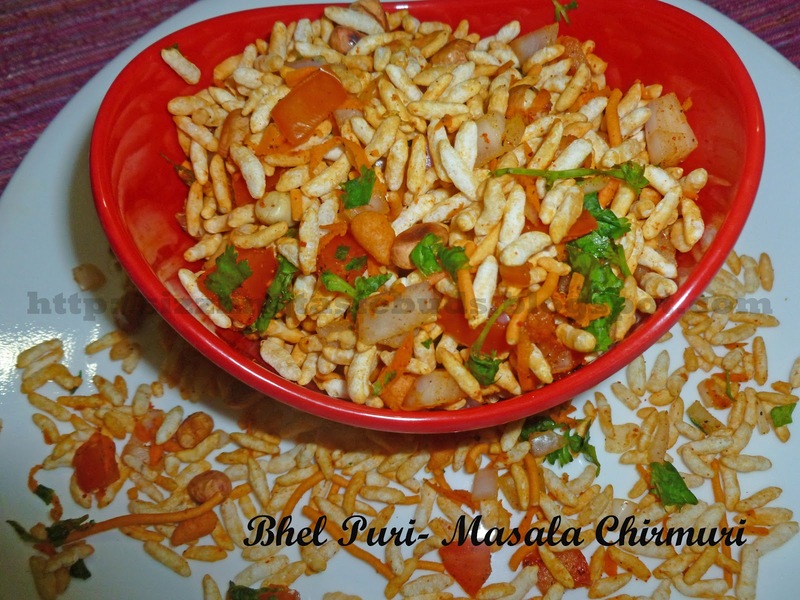 Have this spicy, tangy, masaledar puffed rice with hot tea at evenings especially during rainy season. Wow! Perfect snack with family during the lazy rainy weekends. Its been ages when I actually used to enjoy this at street corners in the evenings. Wow! what an experience. Puffed Rice is also called Chirmuri or Mandakki in Kannada. 1. Mix all the ingredients in a wide bowl except Puffed rice. 2. Add puffed rice to the above mixture and mix well till the puffed rice is nicely coated with the masala's. 3. Squeeze a tsp of lemon juice . Mix well and serve immediately else puffed rice will get soften and doesn't taste good. Enjoy this Indian Bhel Puri with a cup of Hot Hot Tea. bhel is one of my fav street food.. yours looks so delicious..